Our party yacht rental delivers stunning vistas, sunny skies and beautiful blue waters. Ready to book a yacht for your event? Click here to request a proposal! 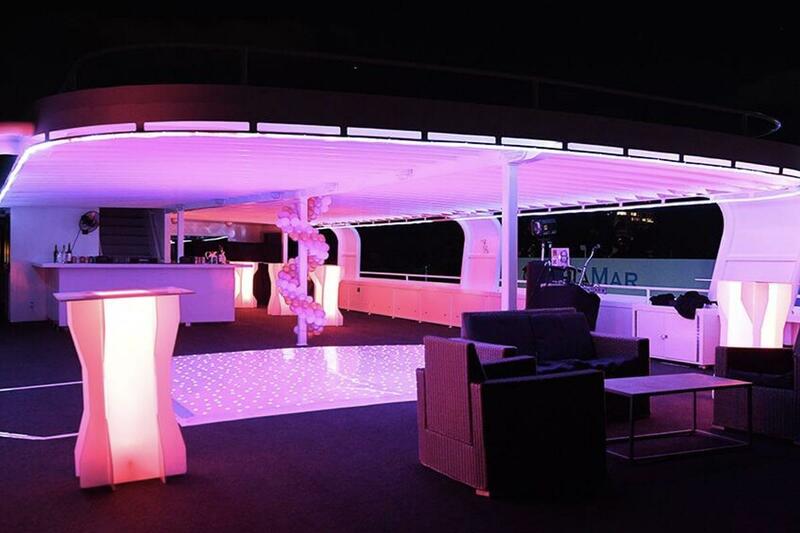 Our creative team of party planners makes it easy for you to prepare for your exciting yacht rental. Whether you are hosting a private or professional event, we have everything you need to make it a special occasion. To spice things up with some fun, you may want to add a theme to your party. You can even opt to include a running gag or tag line that best represents you or your company. Some exciting themes we have had in the past include: casino gaming, a costume ball, mystery night, a maritime theme, sports, etc. You may be interested in having an ethnic theme that your family and friends will enjoy. We can also personalize a corporate event with the company logo and other branding. And best of all, our team has access to the resources you need and does all the work for you. Just tell us what you want and consider it finished. Once you have your guest list completed, you can select which one of our stunning yachts will serve as the venue for your event. Our impressive 128-foot Grand Floridian yacht easily accommodates up to 550 guests, and has 4 decks, a custom full-service bar, 13 HD TV’s, state of the art media capability, elevator service, multiple dance areas, private staterooms below deck and much more. Your party guests will love cruising along Florida’s beautiful coast in style and luxury aboard the Grand Floridian. For more intimate affairs, with up to 60 guests, we recommend our elegant Summer Wind yacht. This lovely lady boasts 3 decks, modern amenities, state of the art media capability, a custom full-service bar, a swim platform, lush lounge areas both inside and out, and private staterooms below deck. Discover your very own private world-class yachting adventure aboard the Summer Wind. We serve up the finest five-star cuisine on our party yacht rental excursions. You can opt for a light gourmet luncheon, buffet-style dining, or a plated full-course dinner with all the extras. We have an extensive menu, offering a variety of ethnic and vegetarian meals that are sure to please even the most formidable palates. You can also select from a full range of beverages, delicious desserts, and add-on stations that include popular extras like sushi, tailgate grill, pasta, meat carving station and much more. Expand your horizons with a marvelous party yacht rental, where you and your guests can enjoy stunning vistas along Florida’s beautiful waterways. Call or register online, to speak with one of our yacht rental specialists who will plan and execute your event from inception to completion. To begin making plans for your next great event, contact Charter One today at: 954-771-0102. Searching for Where to Throw a Party This Holiday Season?